Riding the high of hypomania again. The increase in my abilify triggered it, I’m sure. I’ve spent all our money on the genius idea of starting up shop again on etsy, now I’ve grown past etsy and launched my own website selling aromatherapy jewelry and eventually, once I am certified, blends as well. Link here evelynrosearomas.com It was all good for a couple of weeks but now I am struggling to focus on any one task, I don’t have the damn time to bathe or dicker with my kids. I am an artist caught in the throes of her passion, which right now is aromatherapy. I upped the ante by setting the goal of participating at the local farmers market/flea market next month. I’m breaking a lot of things and forgetting important stuff. I missed an appointment with my psychologist Tuesday and broke some dishes trying to put them away super fast and efficiently. The angels sing when I am on a roll and everything seems touched by the hand of god. Even broken dishes. I hear people whispering my name and feel them staring at me. Every other driver on the road is trying to kill me, possessed by demons as they are. I can’t break away from the intensity of the need to craft long enough to go to the gym and have put it on the back burner for now, I have got to get myself under control. I cut down tremendously on my caffeine intake and have been trying to get enough sleep. Alas, here I am middle of the night, blogging. I’m enjoying some aspects like the inspiration and motivation, but other aspects are just as bad as depression. When I’m depressed I don’t have the energy to clean, now, I don’t have the time nor patience. I’m a wreck. 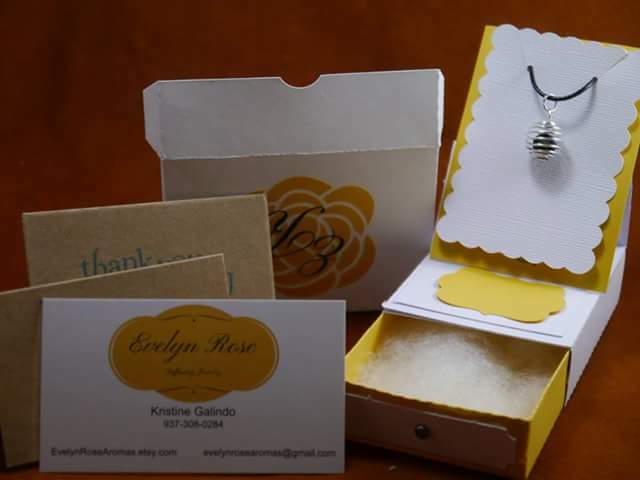 I’m including a pic of my product packaging because making tiny boxes was my passion for two days straight. My mom stepped in and told me I was out of control, thanks mom, I am aware. I asked her to be my anchor and help keep me grounded, she said I had to learn to be my own anchor. I’m biochemically incapable of being my own anchor but thanks anyway. She said she and my husband are my enablers. Probably at least partially true. But who is gonna talk me down? Not me, I’m not exactly thinking clearly right now. Several years ago, I did the same thing. I discovered aromatherapy and couldn’t find any jewelry online that I liked, so I decided to design my own. I did fairly well for a while, sold on etsy, sold to some online friends, sold some at a health fair, and from a Facebook page; but then a very bad depressive episode hit and now no more wonderful creative inspiration. I have thousands of beads, hundreds of jewelry supplies, and zero desire to create. There should be a website like etsy/ebay for selling off manic episode detritus. The story of my life! Perhaps you should hang onto those supplies, you never know when the desire to create will return. I know I go through long periods when nothing gets done, I usually find a new fascination when my enthusiasm returns, but I cycle back through old ones as well.